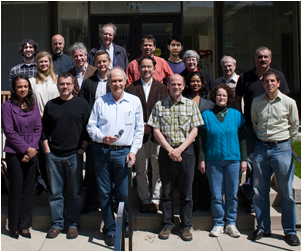 Physics Frontier Center team, KICP. Our Center will push cosmology to the edge - to reveal and clarify the new physics underpinning it or to find the flaw within the current paradigm, either way transforming cosmology and particle physics. Five research Hubs (CMB Polarization, Dark Matter, Joint Analysis, and Supernova) bring together scientists and projects - from within the PFC and around the world - to get at the new physics underlying inflation, dark energy and dark matter. Four major projects anchor the PFC: the former Chicagoland Observatory for Underground Particle Physics (COUPP) which is now PICO, the Dark Energy Survey (DES), the South Pole Telescope (SPT) and the Dark Matter in CCD's (DAMIC) experiment. 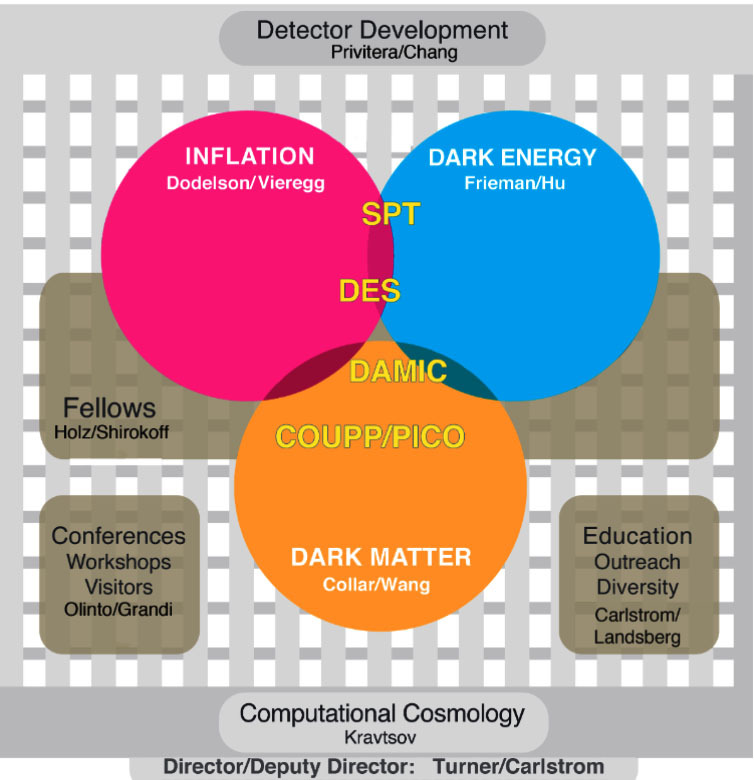 Detector Development and Computational Cosmology are cross-cutting, science-enabling activities. The Conferences, Workshops, and Visitors MA will engage the larger cosmology community, and the Education, Outreach, & Diversity MA will provide opportunities for all PFC members to broaden the impact of their research. The KICP Fellows are the centerpiece of the PFC, and the opportunities afforded them by the PFC will prepare them to be teacher/scholars and future leaders in cosmology. Among the features of this PFC are continuing strong ties with the Fermilab Center for Particle Astrophysics, new ties to Argonne National Laboratory and 19 Key Collaborators from around the country.